The seedlings are all doing very well. Everything sprouted faster than expected which I am attributing to the warm temperatures of the room that we kept things in. The room was about 75 degrees for the first week and a half. 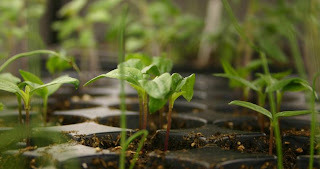 Above are some pepper seedlings with some true leaves showing. 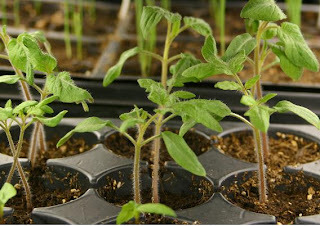 A few tomato seedlings. I can't tell, are these looking a little leggy? I've been thinking about adding some additional light fixtures but I'm not sure if it's necessary. Above is some Russell Lupine. These seedlings look adorable and I can't believe how big they're getting. We planted these 2 weeks ago and expected germination to take ~3 weeks! We're going to plant a bunch of these in the garden. I think that these might help improve soil by fixing nitrogen and possibly phosphate. At a minimum, the flowers will be pretty and hopefully make for some good food for the bees! 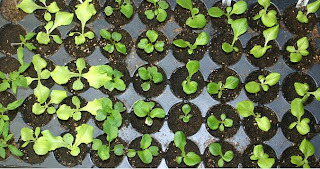 Your seedlings look perfect. :) Our onions are just starting to come up and we will be planting more tomatoes tomorrow. 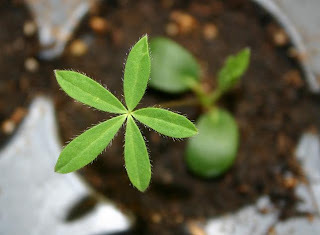 Thanks for the information on lupine, I did not know that they fixed nitrogen...I may have to add some of them to the garden this year. All of them look great! I don’t think that tomatoes are leggy, I think that they are just the perfect size.